Set a budget and stick to it. Keep in mind the total cost of purchase including shipping, taxes, and accessories involved in it. There may also be an opportunity to get a package deal complete with all the items you are looking for, which may be more cost efficient for you. While buying the table think about the ergonomic factors and your comfort. Consider 3 main things – Carrying weight, table width and table height. Carrying Weight – Depending on the width of your table the weight of the table can vary between 22 and 40 pounds. Height – Find a massage table that comes with adjustable height settings so you can adjust it for your comfort level. Width – You’ll need to find the compromise between your and your clients comfort here although 28-32 inches is highly recommended for most massage therapists. A therapist having to reach too far across the table could be uncomfortable but if the table is too narrow then your client may be worried about falling off when adjusting positions. Some tables have the capacity to extend the tables length by approximately 12 inches and/or width by 6-8 inches. Choose a strong and stable massage table which can take a fair amount of weight. Before buying check the reinforcing elements, quality of craftsmanship and the kind of wood, aluminium, or plastic used. Check the weight rating of the table which should be at least 500 pounds of downward applied force. If you specialize in pregnancy massage you might look to purchase a table that will assist in creating the best experience for your pregnant clients. 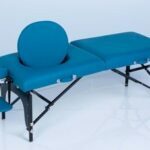 Some tables have breast recesses, adjustable abdominal support and many other adjustable parts to make the massage comfortable for pregnant clients. You can check out this high quality pregnancy massage table from Gecko massage (here). Selecting the proper table is a great start, but adding accessories will add an extra advantage to your massage technique; it will take the massage experience to the next level. There are many accessories to choose from that will assist in the many different specialties of massage therapy treatments. Usually the price range of massage tables is around $250 to &700. There may be some tables which have the same look and features but have different prices depending on the dealer or location. Focus on the quality, price, shipping costs, tax and additional benefits. Lastly, be sure to check of a warranty on the table. A quality brand will always provide a warranty. A table with lifetime warranty could be worth extra amount up front as a long term investment. So before you head out shopping for a massage table, keep these points in mind to ensure a great purchase that will add an extra boost of relaxation for your client.